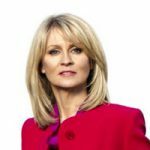 Before entering politics, Esther McVey worked for 12 years as a broadcaster and producer and was the youngest female host of ITV’s breakfast news alongside Eamonn Holmes. Before setting out on her own Esther worked in the family construction business. In 2010 she was elected as the first Conservative MP on Merseyside since 1997. And in 2014 she was made a Privy Counsellor. Esther McVey was Minister of State for Employment from 2013 – 2015 and went on to chair the British Transport Police Authority, as well as to become an advisor to Floreat Merchant Bank and Hume Brophy. In the 2017 General Election she was appointed MP for Tatton. Whilst running her own business she founded the largest business women’s network in the Northwest and was nominated for both Merseyside Woman of the Year and Cheshire Woman of the Year. She has an MSc in Corporate Governance. Whilst in government Esther initiated the social media campaign, #NotJustForBoys, and she has written a series of career books for school pupils which she adapted into a play with the National Youth Theatre. After a successful run in London’s West End, it will be touring the country later this year. With her unique background encompassing broadcasting, business and politics, Esther is a great corporate host and speaker, at home facilitating and moderating panel discussions, as an after dinner speaker or delivering keynote speech on contemporary social and political issues. “Esther McVey spoke at our Gala event in the House of Commons to 200 plus business leaders with interests and expertise spanning diverse policy areas. No mean feat, but Esther pulled it off with aplomb. She was entertaining, insightful and thoroughly commanding, moreover her anecdotal stories were genuinely funny, which isn’t always the case within the illustrious four walls of parliament!” – Daniel Grossman, The Parliamentary Review Magazine. Esther McVey was Secretary of State for Work and Pensions until Nov 15 2018.